There&apos;s a giant blue anteater with open arms smack dab in the middle of the Destination Irvine float, "Innovation Rocks!" Blue is one of the most difficult colors to create with flowers, because a true blue is rare in nature and flowers that we see as blue might look more purplish on television. Dyed flowers, even those tinted with special products while growing, are not allowed on Rose Parade floats. Every color on a float is the natural color of the material used. But there&apos;s a giant anteater named Peter who needs to be blue. DI sat down with Lyn Lofthouse, floral director at Phoenix Decorating Company, to ask about Peter and find out more about decorating a Tournament of Roses float. Lyn met her husband, President/CEO of Phoenix Chris Lofthouse, on the job. She has worked on floats for more than 30 years, starting in the art (painting) department and moving to contracting, which is welding and sculpting the metal frames. At the end of a shift, she would often help the floral designer. "I had been a crew chief, so I knew floats," she said. 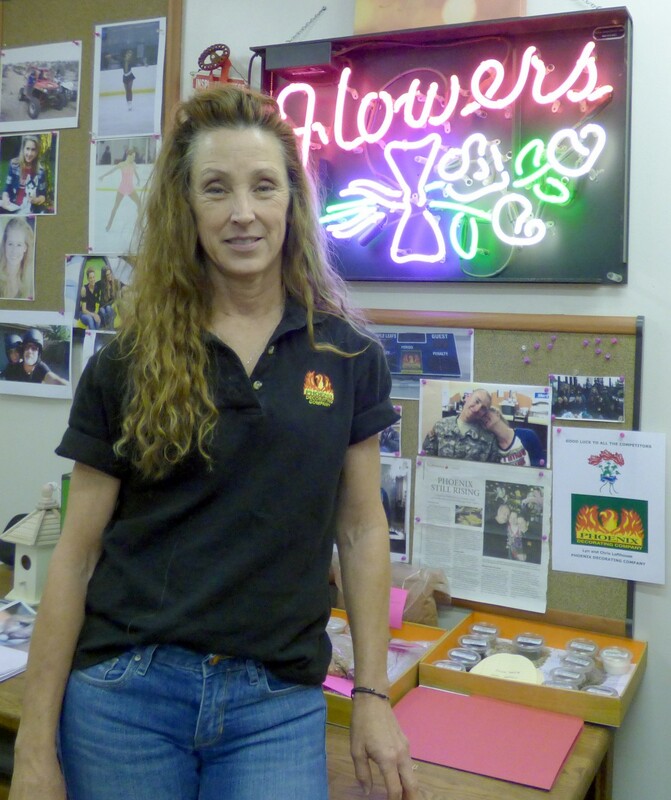 While the company went through several floral designers, Lyn continued working as a contractor. "Finally, I just took over the job-I had trained two people. I slowly moved into it.... I&apos;m always looking for what&apos;s the best material for each individual prop and where it is on the float." Lyn orders the materials, both dry and fresh, to be applied to specific floats. The first order is sent in April and monthly after that, increasing to weekly in December. The materials come from all over the world, though she gets as much as she can from the United States. South Dakota, New York, Hawaii, California; south of the border to Mexico and South America and across the sea to China and Japan. She favors Mom-and-Pop growers, those with 10 to 40 acres. "Mom and Pop farms are fun to work with," she said. "Different parts of the world have different growing seasons. I learned to have more than one grower in one place. Whoever has it, I will call." Requests are created for each float and set aside specifically for the float. "Everything I order is for that float," she said. "You can&apos;t wing it." Decorators get the materials from the flower tent, where they are massed in buckets on the floor and tables. The people staffing the tent make sure the right quantity of flowers goes to the right float. Lyn said she doesn&apos;t worry if the order comes in a couple hundred short, but if it is several hundred, she has to pull from another float. She puts together a book for each float that is given to the crew chief, who manages the decorating process. "Front to back materials, even glue," she said. If there are special materials, the book explains how to use them. If it can&apos;t be adequately explained on paper, she puts a note in to come to her for a visual. But now, back to Peter. "Blue is always hard, unless it&apos;s iris petals which can be true dark and light blue," Lyn said. For Peter, she has ordered statice, but "statice leans to the lavender side." She puts in special orders to growers that Phoenix works with regularly so they can grow the materials each float needs, including the light blue statice she ordered in July. Down at the float barn, Rosemont Pavilion in the Rose Bowl area, crew chief Lauren stood by volunteers cutting the blue petals off statice stems for "Innovation Rocks!" last Saturday. She said that Peter is three different shades of blue. "There&apos;s a different shade in every shipment," she said. "We will wait until it&apos;s all cut, and figure as we go." Statice and strawflower are two of the most common flowers used in "dry dec," which is decoration with dry materials such as seeds, oatmeal, natural wood, rice, beans, lentils. 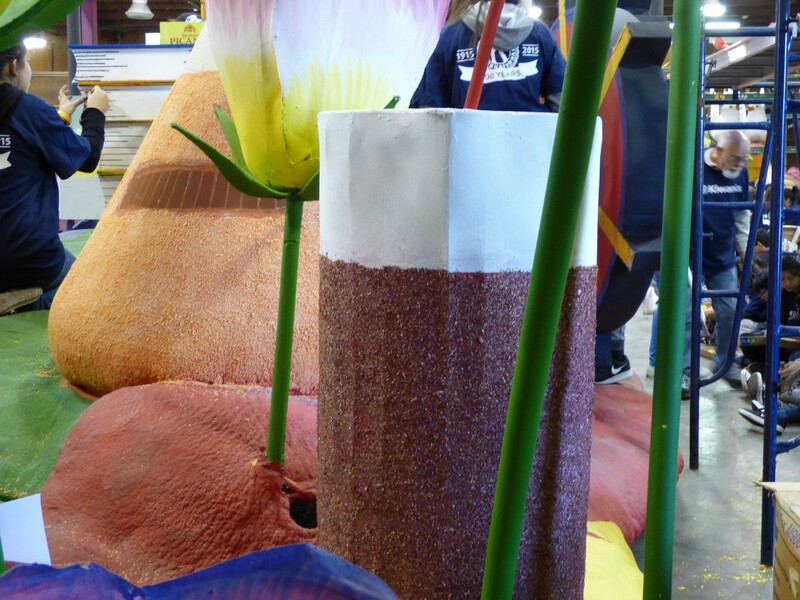 Most of the solid colors on the Destination Irvine float are these two materials, such as the red strawflower used on a beaker. The orange flask is powdered lentils. The centers of the poppies are hyacinth root (the black, hairy-looking thing in the photo), purple statice, and fresh flowers. Lyn said that statice is shipped in each week in December for the upcoming weekend&apos;s dry dec, which occurs the first three weeks. Though it dries on the stem in the field, it has to be cut and shipped immediately in water buckets to avoid rot. Every Friday, crew members cut down the stems to ready the flowers for the volunteers to snip. Some of the dry materials are pulverized in blenders to create a smoother look. At Rosemont Pavilion, Kiwanis International is responsible for supplying volunteers. 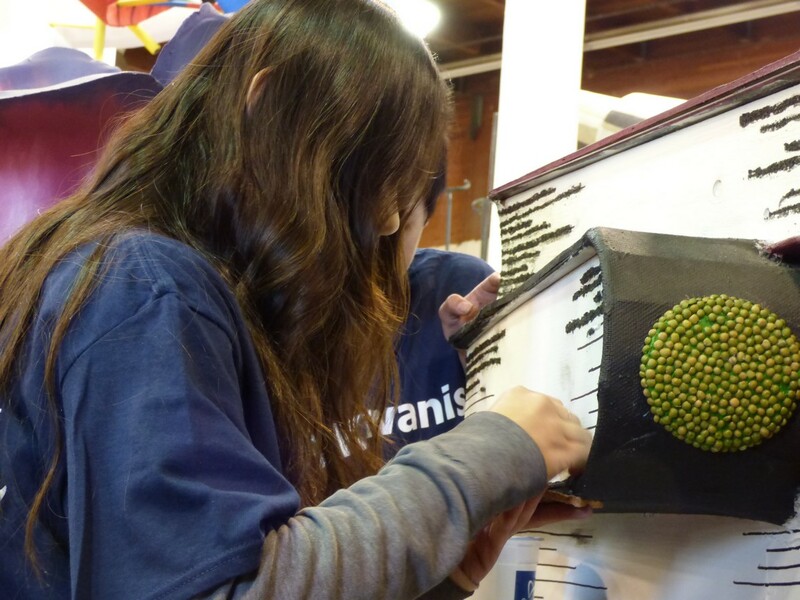 Members of Key Club (the high school Kiwanis auxiliary) Teresa and Ricky were gingerly applying onion seed in narrow rows to simulate the pages of the books at the front of the float. Though there were no Irvine volunteers working on the float, crew chief Lauren noted that she is from nearby Lake Forest. I love that the float represents so much science," she said. "There&apos;s so much industry in Irvine." 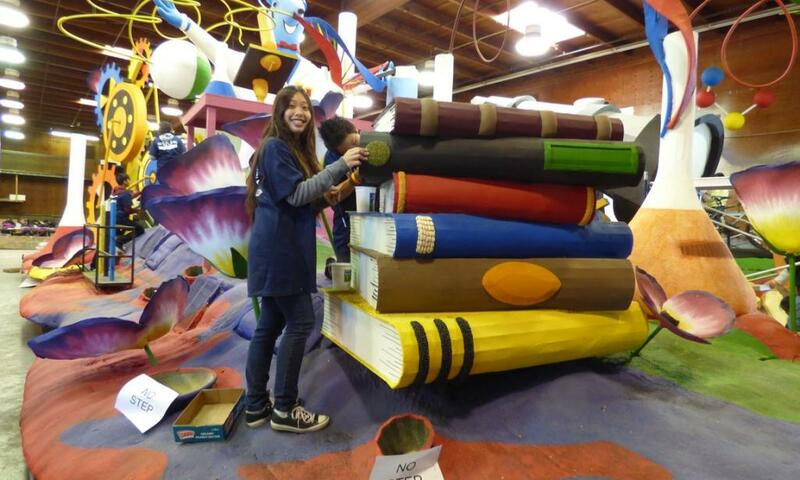 Laurine, a one-year Irvine resident who is with the Lutheran Hour Petal Pushers, said "I think the float is amazing! I love Irvine. I think it&apos;s beautiful and safe." 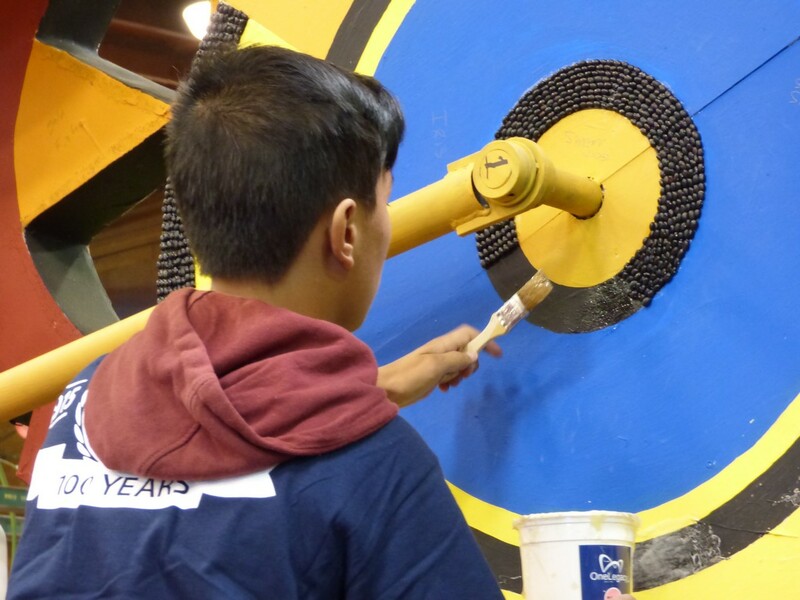 Next blog: Getting the float dressed in fresh materials, and what makes the bright colors pop.